Don’t drive in Mexico, they warned. The cops will pull you over and take all your money, they said. It’s suicide! 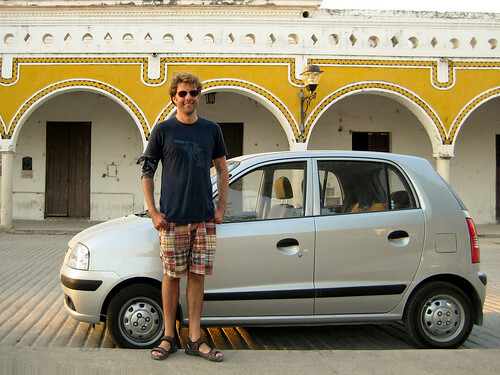 Over the course of two and a half weeks we put over 2000 miles on our little rental Hyundai Atos, and are here to tell the tale. Before leaving the US, we bought International as well as Inter-American (for parts of South America) licenses at our local AAA for $15 a piece. We didn’t have specific plans to drive, but we had rented a car in Brazil a few years ago, and estimated that Europe might be good place to have some freedom and wheels. AMEX offers two levels of additional car rental protection at around $20 ($18 for CA residents!) which in and of itself is why we carry their card with us on all trips. Online rates won by a long shot (we used CarRentals.com) at $16/day through Hertz. In retrospect, we should have paid the extra buck a day for Avis, because their service, personnel and cars were much nicer. In Mexico, liability insurance is required for all rentals, but what they don’t want you to know is that it’s required to be part of the price. No additional nothing. It was hard to get the Hertz representative to acknowledge that, but once she did we were golden. $16 a day, no extra nothing. Keys in hand to our muy pocquito radio-less Atos, we were ready to get on the road. Here’s where the fun starts, folks. Hertz doesn’t have maps. Hotels have maps, but they’re drawn only as a cartoon suggestion of where you may or may not be. Lots of streets are one-way only. The lanes don’t really mean anything, and everyone knows the boundaries of their vehicles down to the quarter inch, and they will use that information against you. Oh, and there aren’t as many roads to connect cities as we’re used to. We were always safe, even though we avoided the toll roads for slower free routes (tolls really add up at about $15 US each). We never drove at night. We learned about highway speed bumps quickly (you’re going 70 mph and yes, there will be a whole gauntlet of them around a blind turn, in the shade, 2 miles from the nearest village). We had the exclusive pleasure of stopping at local “truck stop” lunch shops, eating entire plates of empanadas for $1, or stacks of homemade hot tortillas. We marveled at the endless road-work, the inaccurate distance measurements (90 miles to Merida! Ten minutes later: 98 miles to Merida! 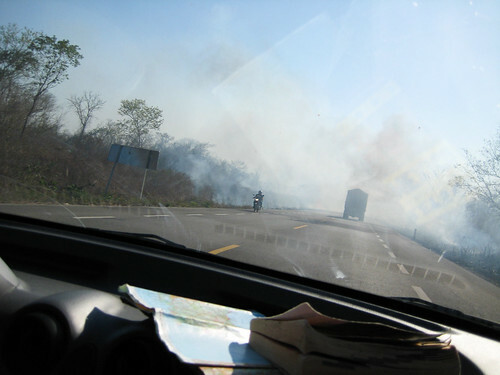 ), the fires raging literally inches from the blacktop. Despite a nation-wide lack of signage and maps, we rarely got lost, but enjoyed total freedom across the entire Mexican Peninsula. No waiting for buses (which were much more expensive than we initially thought), no taxis. 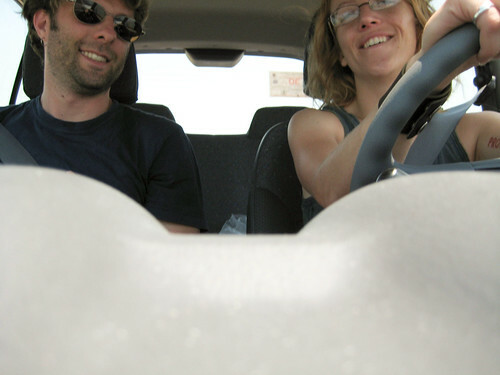 We had plenty of laughs over two dirty budget travelers pulling their clean backpacks out of the trunk of a hatchback — but we were supremely spoiled by our frosty A/C, and could use the trunk to hide our luggage. We stayed well under our $100/day (for both of us!) budget. A very valuable piece of advice was given to us early in our trip: “Don’t speak any spanish to the police no matter how much spanish you know.” In practice, this was perfect. At every police and military barricade, we feigned the stupid gringo smile and said “I don’t speak any spanish.” They would look surprised or laugh and wave us on. Not once were we pulled over. 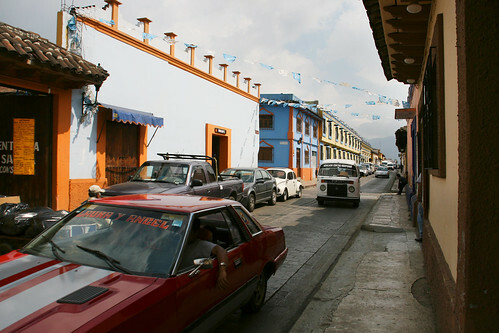 But, just so you know… if luck does bring that cop into your rearview mirror, the standard bribe is $200 pesos (~$15) so you’ll still have enough to laugh about it over dinner later. I really love that your starting to give price breakdowns. I want to do a LOT of travelling in my future and I’m always concerned that I’ll get out there and run out of money.